VERA LUCIA MALLA SALBEGO, stage name VERA SALBEGO, a native of Uruguaiana, RS was born on 29 August. Formed in/PUC/RS Lyrics, and post-graduate degree in Psychopedagogy. High school teacher and Fundamental debuted in literature in 1985 in his hometown with participation by Uruguaianenses Poets Club. Participated in several national and international awards Anthologies of publication. Honorable mention national contest Mário Quintana in the city of Alegrete RS. Author of the books SHOWCASE the heart (2004), paths (2006) Launched at the book fair of Porto Alegre RS. With two award-winning Short film festivals in Porto Alegre and Guaíba RS (dreams and legends 2003), (silence 2004). Vera is also the author of the anthem of the Municipal School of St. Rita elementary school in the city of Guaíba-RS. Participates in the AGES ("Gauchos" writers ' Association), Member of the Academy and Luggage of Virtual poets and writers, Publishes in Recanto das Letras, Poetas Del Mundo, 30 Parallel Magazine and others. 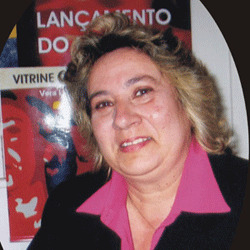 In December 2006 Vera receives Diploma for its contribution in the development of culture in Porto Alegre the Newspapers Cultural Revolution. Publishes the websites Recanto das Letras, Parallel Magazine 30, gym and game room Virtual poets and writers, poets Del Mundo, House of the poet Riograndense. Vera is representative of the city of Guaíba RS as Consulesa de Poetas Del Mundo. The author writes for the newspaper Santiaguenses Lyrics. In 2007 participates in a book from the SEC of education of the city of Guaíba book projects (Project to encourage reading).It is also responsible for the Poetic Magazine along with the poet Carmen Duplicity Laranjeira. Publishes on the site writers. belongs to the Academy of Porto alegrense Lyrics as a corresponding member.Academic Member Immortal, perpetual Patron Patronymic Chair of the Academy of Arts, Sciences and letters from Iguaba Grande Rio de Janeiro Commandery Le Minh of the Academy of letters and arts of Porto Alegre rs. Receives the Leonardo da Vinci Medal awarded by the Academy of fine arts, Place Letters and Sciences-ANBA in 2012. Commandery Lobo da Costa received Parthenon may 2012 Literary. Academic Member of Academy's Immortal letters, arts and Sciences Iguaba Grande January 6/6/2012/Rio.